When the current limited time 30,000-point sign-up bonus offer (available now through September 3) launched yesterday for the Starwood Preferred Guest American Express Card from OPEN, I got a lot of question about the card for small business owners and its perks, so I wanted to give a detailed rundown of the benefits of the business card specifically. 30,000 points – 10,000 after your first purchase, and an additional 20,000 when you spend $5,000 within 6 months. Receive up to 5 Starpoints for every dollar of eligible spend charged directly with Starwood hotels & resorts – that’s 2 Starpoints per dollar spent on the Card in addition to the Starpoints you get as a Starwood Preferred Guest member. Get 1 Starpoint for every dollar of eligible purchases. $65 annual fee, waived for the first year. Welcome bonus offer not available to applicants who have had this card within the last 12 months. Limited time offer available until September 3, 2013. In general, because business cards like this one are meant for business expenses and they generally have less consumer protections than personal credit cards because they aren’t covered by the CARD Act, which mandates how credit card companies can changes APRs, fees and benefits on their consumers. Business credit cards generally have higher APRs as well, but if you pay your bills off monthly (like any good miles and points collector does) these points are moot, and as you’ll see, the card comes with a slew of business-friendly benefits that can save you a lot of money on your expenses. Open Savings: This is probably the biggest difference between the cards. OPEN savings is a series of benefits and savings unique to Amex’s line of business credit cards that can really add up to huge savings. However, there has been a major covert overhaul of the program where you can earn up to either a 10% discount or 4 bonus Membership Rewards points per dollar. This card isn’t eligible for Membership Rewards points, so it’s the discounts you’ll be getting with it including 5% off Hyatt, 5% off Courtyard by Marriott and up to 10% off at Office Max. 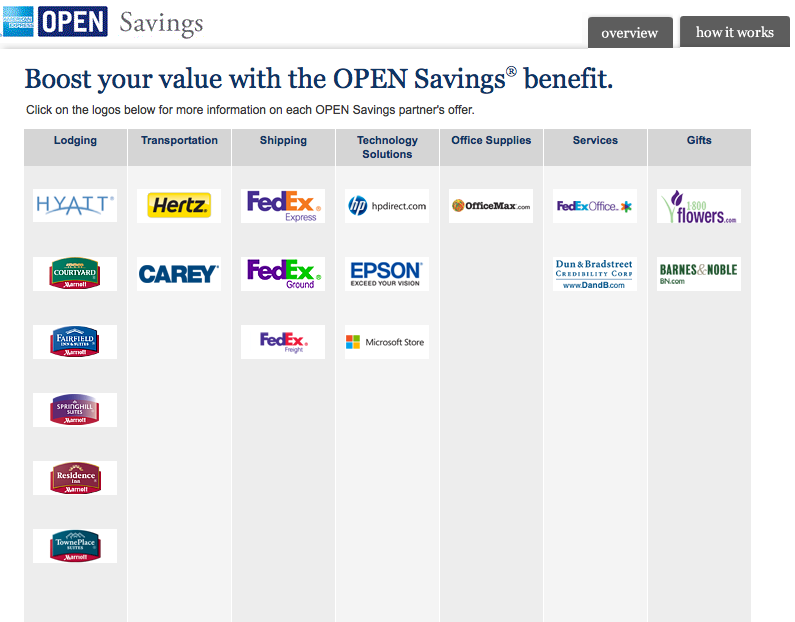 Amex OPEN Savings offers significant discounts at a lot of partner merchants. ReceiptMatch: This feature is an easier way to keep your business receipts organized. It archives receipt images and matches them to transactions on your online statement so no more sorting through stacks of paper and filling out reimbursement forms. Car Rental Loss and Damage Insurance: Amex offers one of the best car rental insurance coverage programs out there including Collision Damage Waiver insurance and premium coverage within the United States, its territories and possessions for this card. Coverage is for as long as 30 consecutive days. You can find the specific policy for you card here. Coverage usually only applies to cards with an MSRP of $50,000 or below and excludes sports cards, SUV’s and specialty cars. Amex also offers premium coverage policies for a flat fee of $24.95 ($17.95 for California residents) per rental period, (not per rental day), and it is considered primary coverage, meaning you won’t have to file a claim with your insurance company, for up to $100,000 of primary coverage for damage or theft and accidental death or dismemberment coverage ($250,000 for California residents), up to $15,000 for excess medical expenses per person, and up to $5,000 for excess personal property coverage ($15,000 for Florida residents). Emergency services by arranging medical transportation, travel and legal assistance which can include doctor referrals, English-speaking lawyers, and customs information. Destination information including details on weather reports, currency exchange rates, etc. Travel Accident Insurance: Travel Accident Insurance can provide coverage up to $100,000 in case of accidental death and dismemberment while traveling on a Common Carrier Conveyance (plane, train, ship, helicopter or bus) when the entire fare has been charged to the eligible Card. Covered persons include the cardmember, each additional cardmember, and each of these cardmember’s spouses or domestic partners and dependent children under 23 years of age. Baggage Insurance Plan: You can receive coverage for lost, stolen, or damaged carry-on and checked baggage when you purchase a Common Carrier Conveyance (plane, train, ship, helicopter, or bus) ticket with your eligible card. As with most credit cards, coverage for this benefit is in excess of the carrier’s coverage, but is up to $1,250 for each covered person for carry-on luggage, and $500 for checked luggage. Roadside Assistance: Things go wrong on the road all the time, but Amex has a roadside assistance benefit for cardholders that can help. Per the terms, Roadside Assistance is a 24-hour dispatch hotline that can send a tow operator or locksmith to assist in an emergency situation at pre-negotiated rates. Cardmember will be charged for any services or goods provided, other than the dispatch hotline. Tow operator or locksmith can provide the following services: towing, winching, jump starts, flat tire change when Cardmember has a workable spare, lockout service when key is in vehicle and delivery of up to 2 gallons of fuel. Services are available when traveling within the United States, Canada, Puerto Rico and the U.S. Virgin Islands and only when Cardmember is present with the vehicle. Rental vehicles are excluded. Purchase Protection: This covers you when something you buy gets broken, lost or stolen. If you buy it using your Amex they are protected for up to 90 days from purchase. Coverage is up to $1,000 per purchase and $50,000 per card per year. Extended Warranty: Use your American Express Card on eligible purchases and membership can extend your manufacturer’s warranty for up to one year on products whose manufacturer’s warranty is under 5 years. Coverage is up to a maximum of $10,000 per item and $50,000 per cardmember account per calendar year. Return Protection: American Express will refund items you buy using your card within 90 days of the date of purchase if the merchant refuses to take it back up to $300 per eligible item, for a maximum of up to $1,000 annually per card. These purchases must be made in the US, Puerto Rico or the US Virgin Islands. Dispute Resolution: If there’s a fraudulent or mistaken charge on your statement, notify Amex and they will work with you and the merchant to help resolve the issue – this is a great benefit since it’s always good to have your issuer on your side in a situation like this. While many business cards actually offer fewer protections than personal credit cards, the business Starwood Amex actually matches almost all the personal cards’ benefits and goes above and beyond them in terms of lost baggage and all the savings and discounts of the OPEN Savings program, all of which make it a great product for small business owners.